Written by B. L. White Inspired by one of the greatest games of all time. A shooting star broke through the small planet’s thick atmosphere. It landed gently on the ground. Smoke settled to reveal the metallic chassis of a gunship. A humanoid climbed out dressed in a flexible power suit. Distant thoughts haunted the nimble bounty hunter’s gaze upon the doomed planet. Zebes had changed much since childhood. Trees from the Arahn Forrest once stood tall and imposing. The bounty hunter remembers running through the woods as a child, the taste of the pure air, the sound of little feet crunching on the leaves, the killing of prey. The hunter gazed at glorious towers of yesteryear beside the broken forest. They had become piles of brick. The armored warrior followed the haphazard trajectory of a Shriek Bat. It was on an awkward careening course, heading towards the ship. The bounty hunter had never seen such odd behavior before. Upon destroying a planet, the inquisitive pirates were fond of mutating the native animals. If left unchecked, more grotesque mutations, best synonymous with the space pirates, would rein on this most sacred of planets. The bounty hunter had come to prevent this. He had come too late. But, how could such an advanced race of birds fall to pirates? Samus Aran was a protector and bounty hunter for Galactic Freedom. Many young men idolized the prototype Chozo armor he wore. None had seen his face, only the iconic helmet that covered it. If they only knew the truth. Samus Aran took off the helmet. The soft face of a woman emerged beneath long golden strands of hair. Her delicate beauty juxtaposed the masculine frame of armor surrounding her. Crisp blue eyes took in the Shrieker as it wondered her way. She breathed in the stale air of her home. She had returned, only to find it dieing. Samus tucked her blond stands back in, such intrusive long hair for brutal work like hers. She would have cut it long ago but for that old cynical bird. Samus kept her hair long in memory of the deceased bird and mentor. The helmet clicked into place on the power suit. She jumped off the gunship with an athletic flip landing lightly on the ground. She shifted her eyes towards the hostile target. The bat charged her then, with a hideous shriek. There was no territorial reason for the bat to attack her. Such was the way of things now. It ran into a burst of bright energy. Smoke curled off the tip of Samus’ power gun. Broad shoulders supported the emotionless helmet. Curious eyes gazed at the charred corpse behind a “V” shaped green visor. There was a time when she had hunted shriekers carefully with a spear, preserving the meat for a good meal. Now she shot them to feed her suit with its life force. She reminisced of simpler times… sitting near a fire after a hunt… hearing the bird-like race singing those meaningful conversations… she messed them: Kerrfu, Grrunco, Plogos and yes… even that cynical old bird, the wizened Empress. Would the massacres ever stop? First her human parents and colony… thousands of them murdered on planet K-2L, now the systematic genocide of the sentient race of birds who raised her. The pirates murdered everyone she touched. Samus stepped over the ruined remains of the Shrieker–the sentient armor sucked in the force that gave the bat life–and walked towards one of the fallen shrines. The tower of petrified wood and embellished stone precariously swayed in the wind. The Chozo had formed the Shrine of Prophesy long ago with expert loving care. Carefully had they woven the brick tower with the organic tree, now only broken monoliths and deadwood. Once upon a time, many years ago, on a night very different from this day, the Shrine of Prophesy rose above all things. Placed at its peak stood a wise and cynical bird. 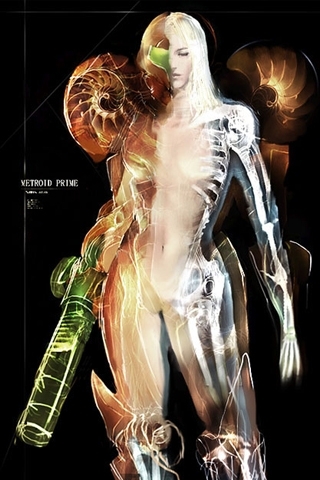 September 2, 2010 in art, Gaming, Metroid Origins, Writing. ← Ground Zero Mosque vs. the Freedom of Religion? Very well written my friend. I can see the world you are creating now much more vividly. Compare this with your earlier work.